Researchers from RMIT University in Melbourne, Australia have demonstrated for the first time a working rechargeable "proton battery" that could re-wire how we power our homes, vehicles and devices. The rechargeable battery is environmentally friendly, and has the potential, with further development, to store more energy than currently-available lithium ion batteries. Potential applications for the proton battery include household storage of electricity from solar photovoltaic panels, as done currently by the Tesla 'Power wall' using lithium ion batteries. With some modifications and scaling up, proton battery technology may also be used for medium-scale storage on electricity grids – – like the giant lithium battery in South Australia — as well as powering electric vehicles. The working prototype proton battery uses a carbon electrode as a hydrogen store, coupled with a reversible fuel cell to produce electricity. It's the carbon electrode plus protons from water that give the proton battery it's environmental, energy and potential economic edge, says lead researcher Professor John Andrews. "Our latest advance is a crucial step towards cheap, sustainable proton batteries that can help meet our future energy needs without further damaging our already fragile environment," Andrews said. "As the world moves towards inherently-variable renewable energy to reduce greenhouse emissions and tackle climate change, requirements for electrical energy storage will be gargantuan. "The proton battery is one among many potential contributors towards meeting this enormous demand for energy storage. Powering batteries with protons has the potential to be more economical than using lithium ions, which are made from scare resources. During charging, the carbon in the electrode bonds with protons generated by splitting water with the help of electrons from the power supply. The protons are released again and pass back through the reversible fuel cell to form water with oxygen from air to generate power. Unlike fossil fuels, the carbon does not burn or cause emissions in the process. The researchers' experiments showed that their small proton battery, with an active inside surface area of only 5.5 square centimetres (smaller than a 20 cent coin), was already able to store as much energy per unit mass as commercially-available lithium ion batteries. This was before the battery had been optimised. "Future work will now focus on further improving performance and energy density through use of atomically-thin layered carbon-based materials such as graphene, with the target of a proton battery that is truly competitive with lithium ion batteries firmly in sight," Andrews said. RMIT's research on the proton battery has been partly funded by the Australian Defence Science and Technology Group and the US Office of Naval Research Global. The working prototype proton battery combines the best aspects of hydrogen fuel cells and battery-based electrical power. The latest version combines a carbon electrode for solid-state storage of hydrogen with a reversible fuel cell to provide an integrated rechargeable unit. 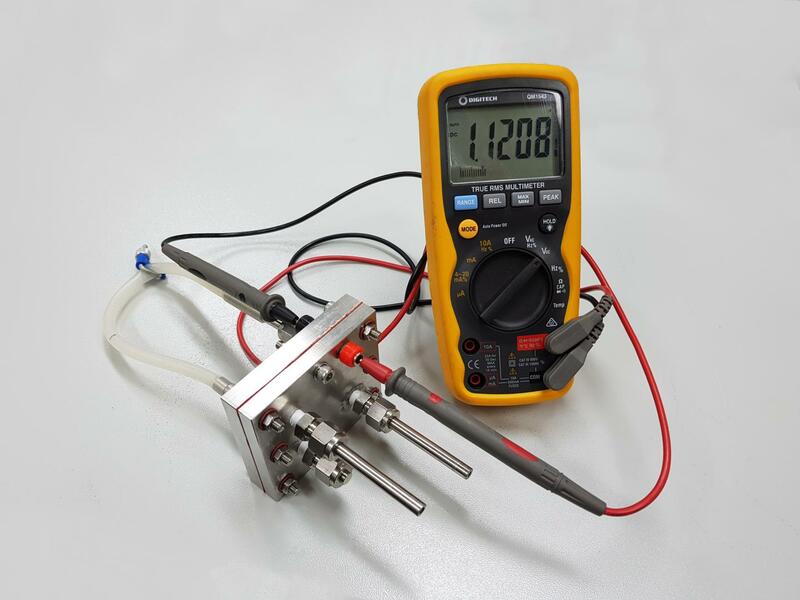 The successful use of an electrode made from activated carbon in a proton battery is a significant step forward and is reported in the International Journal of Hydrogen Energy. In electricity supply mode this process is reversed; hydrogen atoms are released from the storage and lose an electron to become protons once again. These protons then pass back through the cell membrane where they combine with oxygen and electrons from the external circuit to re-form water. A major potential advantage of the proton battery is much higher energy efficiency than conventional hydrogen systems, making it comparable to lithium ion batteries. The losses associated with hydrogen gas evolution and splitting back into protons are eliminated. Several years ago the RMIT team showed that a proton battery with a metal alloy electrode for storing hydrogen could work, but its reversibility and rechargeability was too low. Also the alloy employed contained rare-earth elements, and was thus heavy and costly. The latest experimental results showed that a porous activated-carbon electrode made from phenolic resin was able to store around 1 wt% hydrogen in the electrode. This is an energy per unit mass already comparable with commercially-available lithium ion batteries, even though the proton battery is far from being optimised. The maximum cell voltage was 1.2 volt.